Editor’s note: This post was contributed by Holger Voss, an astrophysicist based in Spain who has worked on data delivered by ESA’s Gaia observatory. 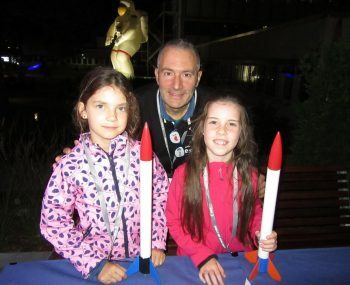 He’s also an enthusiastic space & STEM educator and scale-model rocketeer, and he was at the ESOC mission control centre in Darmstadt, Germany, on 8 September 2017, to celebrate the centre’s Long Night of the Stars and help 5000 visitors experience the excitement of launching rockets. It was a great honour to be invited by ESA to showcase my miniature models of ESA launchers during the event celebrating 50 astonishing years of ESOC, the European Space Operations Centre, in Darmstadt, Germany. At ESOC, the work to control a satellite normally starts from the moment the satellite separates from its launcher. But without a rocket to boost the satellite into orbit, there is no satellite mission. Launches are still the most critical phase of any mission: fire, smoke and noise all contribute to the special fascination for people of all ages that is generated by a space launch. Launches of ESA missions, do not take place in Europe for several reasons including geography; they occur instead at Europe’s Spaceport at Kourou, in French Guiana; from Baikonur, in Kazakhstan; from Plesetsk, in Russia; or from other locations, including the USA and India. In my professional career, I have been lucky enough to witness launches from the Space Coast in Florida. Based on the spectacular, life-changing experience of witnessing a launch, I have started to develop a strategy to bring launches a bit closer to Europe, at least for children, youth and those young at heart. My plan to achieve this goal? Construct realistic-looking miniature models of ESA launchers that can actually be launched at public events, supported and publicised through sharing videos and pictures via social and other media so as to reach as wide a public audience as possible. My ultimate goal would be to establish a mini Kourou spaceport! ESA has developed jointly with European industry and agencies very reliable space launchers such as Ariane 5 and Vega. 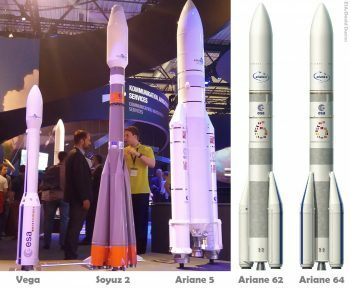 The Russian Soyuz 2 launcher is a great addition to the Arianespace launcher family filling, the gap for medium-size payloads. With Vega-C and Ariane 6, both now under development, new launchers will be able to continue the success in launching commercial and institutional payloads in the future as a new era of spaceflight is about to begin. The Ariane 6 launcher will replace Ariane 5. It has two versions: its medium-size (A62) has two Solid Rocket Motors (SRM), and the heavy variant (A64) has four SRMs. Ariane 6 will ensure reliable access to space for ESA, the EU and other European organisations, at dramatically lower costs compared to using the current launcher fleet. For the Long Night of the Stars at ESOC on 8 September, the Ariane 6 launcher was chosen to be the main star of our small exhibition. 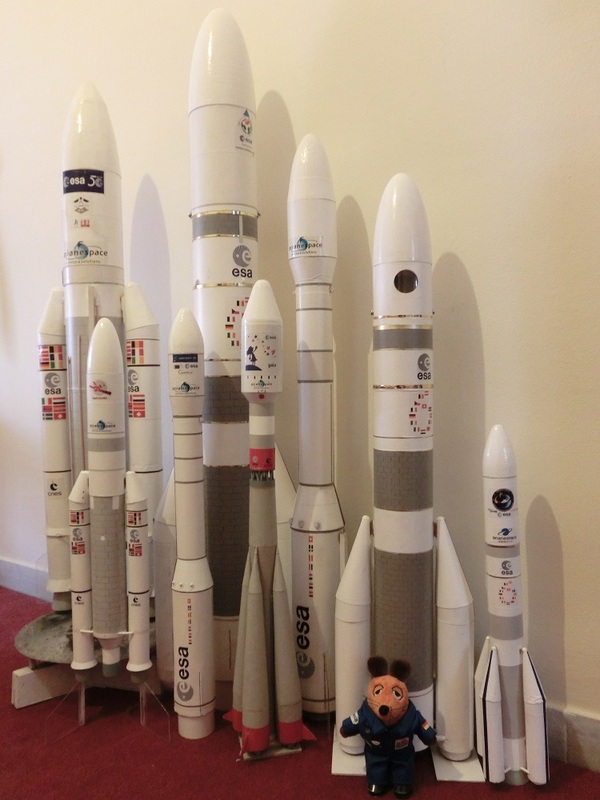 In total, our small team showcased two Ariane 6 models, one Ariane 5 model, one Vega model and one Soyuz 2 model. We also demonstrated some static firing tests of an Ariane 6 SRM model and explained basic rocket science to the audience using water rocket launches. Unfortunately, high winds did not permit launching some of the smaller ESA rocket models that we had prepared for launch. 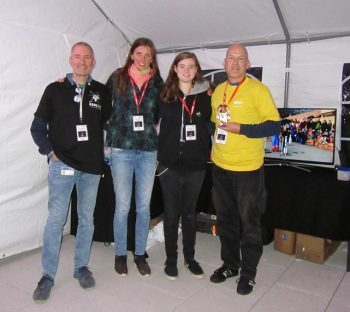 By the way, at this point it might be appropriate to introduce you to the team that was representing the small model rockets exhibition at ESOC. The model rocketry team from left to right: Alessandro Ercolani, Shari Van Treeck, Constanze Kramer and Holger Voss – with his tiny companion and space mascot Mausonaut. I was joined by Alessandro Ercolani, ESA’s Manager of Science Mission Data Systems, a model rocketeer and one of the organizers of ESA’s annual Space Camp; Shari van Treeck, a PhD student from the University of Bonn and former candidate to become the first female German astronaut, and Constanze Kramer, a local space tweep and good friend. As the open-doors event at ESOC got underway on 8 September, Alessandro started off with building some simple model rockets with several kids, who are now proud owners of their first rocket. Shari and Constanze volunteered to support us in communicating with the hundreds (and hundreds!) of interested visitors to our stand. ESA’s Alessandro Ercolani helping kids construct their first rocket. 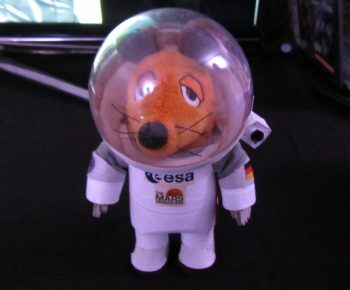 We were joined by a famous European space mascot, Mausonaut, a special friend of mine and a great fan of the Ariane 6 launcher. Mausonaut uses a mini-Ariane 6 to conduct (simulated) launches (watch one via Youtube) for exciting, fictional-yet-realistic missions to MoonDotStation (more information about Mausonaut here). Back to the Long Night of the Stars at ESOC: With help of the launcher models and some videos, we were soon showing the audience how rockets generally work, how our models work and what are the main differences between model rockets and the ESA launchers. We spent some time that evening explaining this to the curious audience with help of launcher models and some videos showing launches of ESA launchers and corresponding model launches. One of the videos shown during the Long Night of the Stars event was a special one: We premiered a video showing the first flight of the 1:72 scale model Ariane 62 with a camera on board – recorded during a launch just a few days before the event. 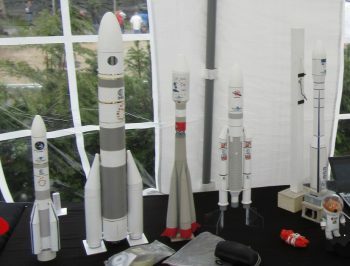 Despite, sadly, not being able to launch any of the ESA launcher models at ESOC due to unsuitable weather conditions, we were able to show some rocketry action with launches of water rockets and a more uncommon test firing of a 1:50 scale Ariane 6 booster model. 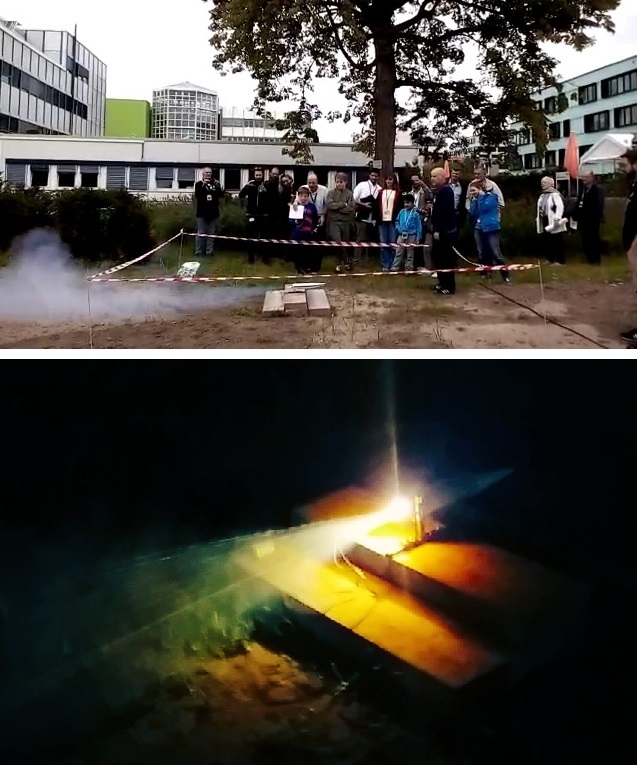 These tests became increasingly impressive with the growing darkness, bringing smoke, fire and some decent noise to the great ESOC celebration. Our entire team was delighted to be able to bring information about model rocketry in combination with information about ESA’s fantastic launchers to an interested audience. It is clear that generating enthusiasm for launchers in the public, and especially for young people and future engineers and scientists, is an important element of space outreach and education. Many thanks to, first, the team of dedicated friends and colleagues who joined me on site at ESOC during the Long Night of the Stars, and, second, to ESA for giving us this great opportunity to showcase our #MiniESALaunchers. Dr Holger Voss is a European astrophysicist from Germany. He has worked for the ESA Gaia mission and for DLR-German Aerospace Center in support of the CNES-led CoRoT mission. Currently, he is working as a STE(A)M educator, as he believes that it is very important to prepare the next generation for the beginning of the new space age. Many thanks for publishing my article. It is a great honour.